Ethical concepts of beneficence, nonmaleficence, justice and respect for dignity can become complicated in modern neonatal critical care, especially since invasive medical therapies may unintentionally increase suffering. Bioethics can help bridge complex ethical concepts to family support and palliative care for babies with serious illnesses and requiring exceptional medical therapies. Neonatal Extracorporeal Life Support (ECLS) and therapeutic hypothermia are examples of life-sustaining innovative therapies that require an ethical framework for shared decision-making with families and medical teams. We suggest a way of structuring team education to benefit urgent ECLS decisions for newborns with moderate to severe hypoxic ischemic encephalopathy (HIE). Decision-making for the best interest of infants requires practitioners to rapidly apply ethically complex concepts. We review the present status of neonatal ECLS and therapeutic hypothermia along with describing our approach to include families in decision making for infants with respiratory failure and moderate to severe HIE. Concurrent palliative care and family support are important so that parents feel empowered to define a meaningful life for their baby and family. Parents of newborns with severe brain injury have reported that communication with medical providers had fragmented information and lacked adequate counseling on comprehensive outcomes. Advanced preparation and education in bioethics will enable medical teams to rapidly apply a deliberative approach to ethically complex concepts. We intend to demonstrate how ethically complex decision-making can be supported by education and preparation in key concepts in palliative care and bioethics (Table 1). While doing so, we review the present status of ECLS and neuroprotection for newborns with respiratory failure and moderate to severe HIE. Table 1: Outreach education in palliative care and bioethics for community neonatal care providers. Progress in ECLS has been balanced by ethical tension since its early use. When in 1975 Baby Esperanza named by her nurses after her mother fled the hospital was treated with ECLS for Meconium Aspiration Syndrome by Dr. Bartlett’s team (Orange, CA), she became the first of many survivors. The name, Esperanza is translated into English as Hope. The decision to treat her on an experimental basis saved her and paved the way for more than thirty thousand infants to receive neonatal ECLS with improvement in survival from approximately 10% to 84%. Despite initial success, complications were recognized, such as when preterm infants suffered serious intracranial hemorrhage during initial clinical use. While neonates with respiratory failure previously represented the largest group of ECLS patients, ECLS is commonly avoided in this group today. Progress in perinatal care and therapies including inhaled nitric oxide, surfactant replacement, and high-frequency ventilation have reduced the need for ECLS in many neonates with respiratory failure and persistent pulmonary hypertension of the newborn (PPHN). [8,9] ECLS remains indicated for acute, severe, reversible respiratory failure that is refractory to maximal medical therapy. Though simple to state, defining when medical therapy has failed and when lung disease is reversible is not straightforward; concurrently, contraindications to ECLS must be weighed. ECLS is traditionally contraindicated with significant prematurity, i.e., <34 weeks post-menstrual age. Late Preterm (34 to 36 6/7 post-menstrual age) infants are more likely to die or have serious neurological complications when placed on ECLS. Thus, the threshold to place an infant on ECLS is typically higher. Meanwhile, successful cardiopulmonary bypass is increasingly common in preterm neonates, raising the question as to whether indications might change with time. ECLS is no longer contraindicated for newborns with some genetic problems, such as trisomy 21. ECLS surrounding treatment of serious congenital heart disease such as Hypoplastic Left Heart Syndrome was once considered futile while now its use is common. Thus, conventional indications and limitations for ECLS are changing while the rates of neurodevelopmental impairment still remain significant among survivors. Severe central nervous system injury has historically been a contraindication to ECLS and, by definition, neonates undergoing cooling are at risk for adverse neurodevelopmental outcome. Thus, concomitant HIE and qualifying for ECLS can create a grey zone dilemma. The degree of encephalopathy must be weighed in decision-making as research in newborn therapeutic hypothermia showed that babies with severe HIE benefit less than those with moderate encephalopathy. [11,12] While cooling has improved survival and outcomes for patients with moderate encephalopathy, the benefit of cooling does not extend to non-acute injury. Thus, we suggest that the potential benefit of cooling should not automatically imply that all newborns with HIE and hypoxemic respiratory failure be placed on ECLS even though they meet ECLS qualifying criteria. Neonates with life-threatening problems depend on caregivers to have both medical knowledge and bioethics expertise. Ethics and palliative care consultations typically function as distinct services in a children’s hospital. However, the majority of neonates with HIE have initial care at community hospitals. Persistent pulmonary hypertension is a serious and common complication in babies with HIE. Hence, preparation for clinically and ethically complex care must extend beyond children’s hospitals and regional centers to community NICUs and transport teams. Regional NICUs should provide outreach education regarding medical indications to transport, initial support of families in informed decision making, and occasionally to offer a comfort care approach at the birth hospital (Table 1). While initial stabilization and a trial of conventional therapy should be instituted before consideration of ECLS , practitioners in different levels of NICUs must be aware of the safe application of therapies to avert ECLS. Ventilator support and vasopressor medicines have been available in diverse NICU hospital settings; in some, nitric oxide and therapeutic hypothermia have also moved beyond regional centers. The significant risks associated with transporting a neonate with severe PPHN and high level of illness should be balanced with the potential benefit of ECLS. Informed permission for transfer should occur after a detailed review of risks, benefits, and potential contraindications with the regional center. 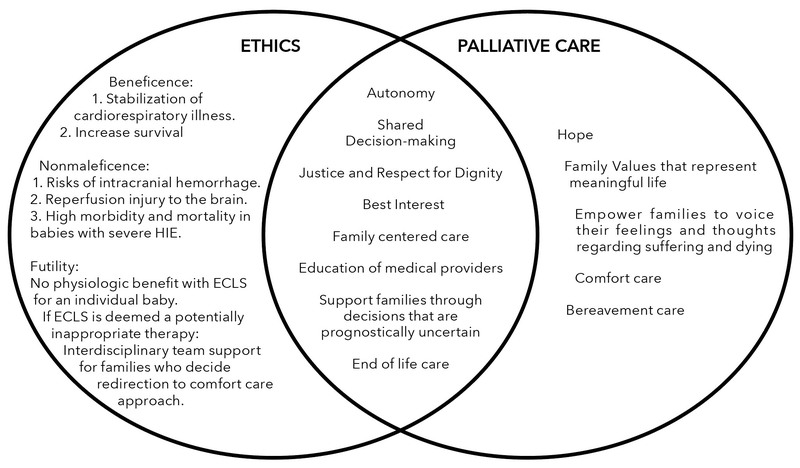 In outreach education (Table 1) and specific patient care we encourage a structured approach informed by best ethics and palliative care practice themes (Figure 1). Our approach of prospectively teaching these best practice concepts in ethics and palliative care, was very well received by medical providers in community NICUs. Neonatal practitioners’ comfort with complex topics was variable for specific cases and if there was any doubt regarding staying in outreach centers, babies were transferred to our regional NICU/ECLS center. Caregivers may have less experience applying the themes reviewed below to term babies with HIE but we believe most practitioners use a similar approach to caring for families delivering extremely preterm newborns. Establishing trusting relationships with the family and team is imperative. In some cases, not proceeding to ECLS is a decision that will appropriately lead to allowing for natural death. If there is significant uncertainty, or there is decision-making conflict at our center, ECLS is typically initiated and the process of shared decision-making continues. Shared decision-making in the context of ECLS can be challenging and requires nuanced discussion for the family to truly be included. The term “futile” is still used by many practitioners and implies that ECLS cannot accomplish the intended physiologic goal. While clinicians should not provide futile interventions, the term implies a certainty of outcome that is rarely present. We suggest that instead of futility, NICU practitioners might describe ECLS as potentially inappropriate and bring clarity to the family’s ethical perspective when considering ECLS for the baby. Can ECLS be potentially inappropriate for a baby and her/his family? Individual moral traditions and commitments can impact health providers’ perspectives regarding the state of science and their definition of standard care. ECLS may provide the immediate benefit of stabilizing a newborn’s cardiorespiratory physiology, but at the same time, it can increase suffering or prolong the dying process if the baby has profound and irreversible brain injury. Parents considering decisions that can result in prolonging survival for a baby with severe neurodevelopmental impairment and and potential dependency on artificial life-support devices may question how best to express their beliefs and family values regarding life and meaningful care. As expressed in the Nuffield bioethics report , value of human life and a trusting relationship for families to express their thoughts and feelings regarding best interests should be integral components of shared decision-making. Every family’s values and beliefs are unique, and the hope of recovery offered with cooling and ECLS may benefit a family trying to envision the future for their baby. The importance of conversations with families regarding treatments of minimal benefit and conflict resolution has steadily been underscored. Key references include The American Thoracic Society and Society for Critical Care Medicine policy statement and five organization policy statements [2,29] regarding shared decision-making and responding to requests for potentially inappropriate treatment in intensive care units. These statements recommend a structured process based approach that encourages continued communication and negotiation during the conflict resolution process. ECLS decision-making in the NICU can result in irreversible outcomes for a baby and family. Convening a hospital ethics committee meeting urgently and/or deferring decisions on a dying baby while a hospital’s ethics consultant operationalizes committee recommendations can be challenging. Importantly, specific strategies to optimize communication in ethical conflicts require professionals who can provide emotional support and actively elicit and respect a family’s values and partner in decision-making. We suggest that early involvement of NICU providers with palliative care expertise through proactive communication may prevent intractable treatment conflicts. Early and concurrent involvement of NICU providers with palliative care expertise may support the resources available for loving families to maintain hope and equanimity while making ethically complex decisions together. Palliative care that supports a baby and family can be considered as an appropriate goal of care. NICUs can be nurturing yet often daunting environments for families and babies. Palliative care expertise can facilitate conversations regarding goals of care and reach unified goals for improving the quality of life of patients and families. [32,33] This can facilitate comfort with invasive therapies while helping families process uncertainty and respond to changing disease trajectories. Conversations with neonatal practitioners should include discussing the outcomes of severe HIE, potential ECLS complications, and treatment recommendations as clearly as possible. Palliative care expertise can advise a family to process their unique feelings regarding suffering, death and which values best clarify their vision of dignity and life. Families who make the informed decision for a comfort care approach and choose not to pursue ECLS should be advised as to what is likely to occur next. Teams should educate families about the normal process of dying and discuss that a baby may still breathe after withdrawal of artificial ventilation. The focused redirection to comfort care approach can support pain management, end of life care and family bereavement. Palliative care practice and teaching should not be linked only to end-of-life care decisions in the NICU. In contrast to the reported experience of adult-oriented palliative care teams, many patients receiving pediatric palliative care are alive for more than a year after initiating some form of medical technology. The NICU is a unique setting and models to best deliver palliative care are being explored. [35,36] Consultative/Specialized models in children’s hospitals usually have an interdisciplinary palliative care team that provides palliative care as a consult service in multiple locations including NICUs. Neonatal practitioners can consult this service for specific patients with complex medical or psychosocial palliative care needs. Integrative models in the NICU operate with primary palliative care principles and interventions enmeshed into daily clinical care for all babies with life-threatening illnesses. This model serves to provide integrated, concurrent palliative care in the NICU for the identified infants and families. Prospectively, the team evaluates and identifies topics (for example-goals of care communication, family conferences, specialized pain management, end of life care) for expanded palliative care support. In our practice, this model extends beyond the NICU to our community hospitals. Our NICU developed a specialized palliative care team that operates through the integrative model and includes neonatologists, registered nurses, clinical social workers, respiratory therapists, clinical psychologist, occupational therapists, certified lactation specialists, spiritual care leads, community hospice representatives and care coordinators. Options for team member training include written materials, lectures, self-paced online learning modules, small group discussions, mentoring, role-playing, a certificate course, local workshops, national conference and seminars. Components of this education extend to referral hospitals through outreach education and an annual regional palliative care conference (Table 1). The team functions as an advanced care service for a range of ill neonates with complex medical and psychosocial problems and phone consultation support is provided to practitioners at community NICUs considering transfer of babies for ECLS or therapeutic hypothermia referral. The team impacts real-time ECLS decision-making by facilitating family centered communication and conflict resolution urgently (Figure 1). In individual cases we typically arrange transport if there is team or family discomfort. Palliative care expertise has reinforced family support and communication for complex decision-making in our regionalized neonatal health care system. Tremendous strides have been made in the care of infants with serious illnesses and their families since the birth of Baby Esperanza and the life-saving use of ECLS. Quality patient care must be informed by the best science with regards to medications and technology, and include family centered care supported by bioethics and palliative care principles. We suggest that systems of care should integrate palliative care support into high risk neonatal services and we focused on ECLS in the setting of HIE for newborns to illustrate the value. Educational programs, relationship development, and clinical protocol development will improve the support of infants and families. The themes of family support and decision-making established in this population are transferable to care of the extremely preterm neonates, infants with congenital malformations and unexpected fetal loss. Specific to ECLS, clinical tools on the ELSO (Extracorporeal Life Support Organization) registry such as Neo-rescuers  may aid in the prediction of risks of in-hospital death for newborns with respiratory failure prior to receiving ECLS. Neonates with severe HIE and respiratory failure can have renal injury and/or cardiac arrest that increase the likelihood of death so such tools may help estimate the predictive risk of such co-morbidities while weighing the potential benefits of ECLS. We reinforce the ethical analysis of risks and benefits during ECLS referral by discussing standard of medical care and potentially exceptional treatments for respiratory failure and hemodynamic instability for each baby and family. In our practice, neonates complete seventy-two hours of cooling on ECLS when standard indications for therapeutic hypothermia are present. We have made the decision to not initiate or discontinue ECLS and redirect to comfort care on an individualized basis for newborns with severe HIE while supporting and collaborating with parents. However, if there are decision-making conflicts and significant prognostic uncertainty for a baby with PPHN crisis receiving therapeutic hypothermia at our center, ECLS is typically initiated with concurrent palliative care team support. Prospective family centered research trials for critically ill neonates may best define meaningful outcomes. Outcomes research should include not only survival and neurodevelopmental follow-up data but also an evaluation of impact of the illness on family function. Randomized control trials may not always be the answers to nuanced/urgent questions and we must reflect if these are generalizable for every baby or location. Partnering with families for education and quality improvement based research is critical. 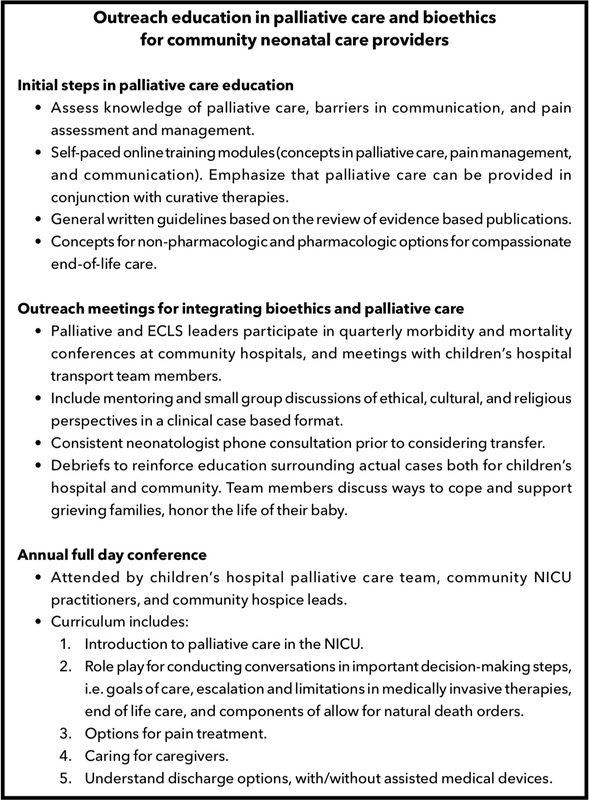 An integrated approach to research, education and clinical program leadership in neonatal palliative care can help practitioners understand the needs of families and thereby advocate for high quality initiatives within their health care system and the community. ECLS referral decision-making support and education for ethically complex situations must extend beyond children’s hospitals and regional centers to community NICUs and transport teams. Newborn infants with life-threatening problems need health care systems to uniquely incorporate bioethics, family centered care, and palliative care support. Family centered decision-making may help amplify the concept that science alone should not determine the ends to which scientific knowledge should be aimed. Progress and growth supporting bioethics and palliative care should be as dynamic and meaningful as the life-sustaining innovations of ECLS and brain cooling. Ultimately, parent perspectives will help us understand the repercussions of innovative therapies for each family’s resilient and beloved newborn baby. Dr. Perugu conceptualized and designed the manuscript, drafted the initial manuscript, reviewed and revised the manuscript and approved the final manuscript as submitted. Dr. Cleary conceptualized the manuscript, critically reviewed and revised the manuscript, and approved the final manuscript as submitted. 1 Daboval T, Shidler S. Ethical framework for shared decision making in the neonatal intensive care unit: communicative ethics. Paediatrics & Child Health. 2014; 19(6):302-304. 2 Kon AA, Davidson JE, Morrison W, Danis M, White DB. Shared decision making in intensive care units: an American College of Critical Care Medicine and American Thoracic Society policy statement. Critical Care Medicine. 2016; 44(1):188-201. doi:10.1097/CCM.0000000000001396. 3 Chapman RL, Peterec SM, Bizzarro MJ, Mercurio MR. Patient selection for neonatal extra corporeal membrane oxygenation: beyond severity of illness. J Perinatol. 2009; 29(9):606-11. 4 Faden RR, Kass NE, Goodman SN, Pronovost P, Tunis S, Beauchamp TL. An ethics framework for a learning health care system: a departure from traditional research ethics and clinical ethics. Hastings Center Report. 2013; 43: S16–S27. doi:10.1002/hast.134. 5 Janvier A, Farlow B, Baardsnes J,Pearce R, Barrington KJ. Measuring and communicating meaningful outcomes in neonatology: A family perspective. Semin Perinatol. 2016; 40(8):571-577. 6 Lemmon ME, Donohue PK, Parkinson C, Northington FJ, Boss RD. Communication challenges in neonatal encephalopathy. Pediatrics 2016; 138(3) e20161234; DOI: 10.1542/peds.2016-1234. 7 Thiagarajan RR, Barbaro RP, Rycus PT, Mcmullan DM, Conrad SA, Fortenberry JD, et al. Extracorporeal Life Support Organization Registry International Report 2016. ASAIO J 2017; 63(1):60-67. doi: 10.1097/MAT.0000000000000475. 8 Hintz SR, Suttner DM, Sheehan AM, Rhine WD, Van Meurs KP. Decreased use of neonatal extracorporeal membrane oxygenation (ECMO): how new treatment modalities have affected ECMO utilization. Pediatrics. 2000; 106(6):1339-43. 9 Roy BJ, Rycus P, Conrad SA, Clark RH. The changing demographics of neonatal extracorporeal membrane oxygenation patients reported to the Extracorporeal Life Support Organization (ELSO) Registry. Pediatrics. 2000; 106(6): 1334-38. 10 Suttner D. Indications and contraindications for ECLS in neonates with respiratory failure. Brogan VT, Lequier L, Lorusso R, MacLaren G, Peek G. ECLS: Extracorporeal Cardiopulmonary Support in Critical Care 5th Edition. 2017:151-158. 11 Shankaran S, Natarajan G, Chalak L, Pappas A, McDonald SA, Laptook AR. Hypothermia for neonatal hypoxic-ischemic encephalopathy: NICHD Neonatal Research Network contribution to the field. Semin Perinatol. 2016; 40(6):385-90. 12 Pappas A, Shankaran S, McDonald SA, Vohr BR, Hintz SR, Ehrenkranz RA, et al. Cognitive outcomes after neonatal encephalopathy. Pediatrics. 2015; 135(3):e624-e634; doi: 10.1542/peds.2014-1566. 13 Jacobs SE, Berg M, Hunt R, Tarnow-Mordi WO, Inder TE, Davis PG. Cooling for newborns with hypoxic ischaemic encephalopathy. Cochrane Database Syst Rev. 2013; (1) :CD003311 doi:10.1002/14651858.CD003311.pub3. https://www.ncbi.nlm.nih.gov/pubmed/23440789. 14 Massaro A, Rais-Bahrami K, Chang T, Glass P, Short BL, Baumgart S. Therapeutic hypothermia for neonatal encephalopathy and extracorporeal membrane oxygenation. J Pediatr. 2010; 157(3):499-501. 15 Forman KR, Diab Y, Wong EC, Baumgart S, Luban NL, Massaro AN. Coagulopathy in newborns with hypoxic ischemic encephalopathy (HIE) treated with therapeutic hypothermia: a retrospective case-control study. BMC Pediatrics. 2014;14:277. doi: 10.1186/1471-2431-14-277. 16 Shah SK, Khan AM, Cox CS Jr. Pulmonary hypertensive crisis requiring ECMO associated with re-warming from whole body hypothermia for hypoxic ischemic encephalopathy: clinical observations from a case series. Eur J Pediatr Surg. 2010; 20(3):205-6. 17 Field D, Juszczak E, Linsell L, Azzopardi D, Cowan F, Marlow N, et al; NEST Study Collaborative Group. Neonatal ECMO Study of Temperature (NEST): A randomized controlled Trial. Pediatrics 2013; 132(5) e1247-e1256; doi:10.1542/peds.2013-1754. 18 Feudtner C, Nathanson PG. Pediatric palliative care and pediatric medical ethics: opportunities and challenges. Pediatrics. 2014; 133(1): S1-7.doi: 10.1542/peds.2013-3608B. 19 Hypothermia and neonatal encephalopathy, committee on fetus and newborn. Pediatrics. Jun 2014; 133(6) 1146-1150; DOI: 10.1542/peds.2014-0899. 20 Lakshminrusimha S, Shankaran S, Laptook A, McDonald S, Keszler M, Van Meurs K, et al. Pulmonary hypertension associated with hypoxic-ischemic encephalopathy-antecedent characteristics and comorbidities. J Pediatr. 2018 Mar 1. pii: S0022-3476(17)31750-X. doi: 10.1016/j.jpeds.2017.12.055. 21 NIH report. Report of the workshop on diffusion of ECMO technology. 2006. 22 The Universal Declaration of Human Rights. http://www.un.org/en/universal-declaration-human-rights. 23 Brosig CL, Pierucci RL, Kupst MJ, Leuthner SR. Infant end-of-life care: the parents’ perspective. J Perinatol. 2007; 27(8):510-6. 24 Antiel RM. Ethical challenges in the new world of maternal-fetal surgery. Semin Perinatol. 2016; (40)227-233. 26 Informed consent in decision-making in pediatric practice. Committee on Bioethics. Pediatrics 2016; 138(2)e20161484;doi:10.1542/peds.2016-1484. 27 Prentice T, Janvier A, Gillam L, Davis PG. Moral distress within neonatal and paediatric intensive care units: a systematic review. Arch Dis Child. 2016; 101(08):701-08. 28 Helft PR, Siegler M, Lantos J. The rise and fall of the futility movement. N Engl J Med. 2000; 343(4):293-6. 29 Bosslet GT, Pope TM, Rubenfeld GD, Lo B, Truog RD, Rushton CH, et al. An official ATS/AACN/ACCP/ESICM/SCCM policy statement: responding to requests for potentially inappropriate treatments in intensive care units. Am J Respir Crit Care Med. 2015; 191(11):1318-30. doi: 10.1164/rccm.201505-0924ST. 30 Blume ED, Balkin EM, Aiyagari R, Ziniel S, Beke DM, Thiagarajan R et al. Parental perspectives on suffering and quality of life at end-of-life in children with advanced heart disease: an exploratory study. Pediatr Crit Care Med. 2014; 15(4):336-42. 31 Wolfe J, Orellana L,Cook EF,Cook EF, Kang TI, Rosenberg A, Geyer R, et al. Improving the care of children with advanced cancer by using an electronic patient-reported feedback intervention: results from the PediQUEST randomized controlled trial. J Clin Oncol. 2014; 32(11):1119-26. 32 Section on Hospice and Palliative Medicine and Committee on Hospital Care. Pediatric palliative care and hospice care commitments, guidelines and recommendations. Pediatrics. 2013; 132(5) 966972;DOI:10.1542/peds.2013-2731. 33 Janvier A, Barrington K, Farlow B. Communication with parents concerning withholding or withdrawing of life-sustaining interventions in neonatology. Semin Perinatol. 2014; 38(1):38-46. 34 Feudtner C, Kang TI, Hexem KR, Friedrichsdorf SJ, Osenga K, Siden H, et al. Pediatric palliative care patients: a prospective multicenter cohort study. Pediatrics. 2011; 127(6):1094-101. 35 Lemmon ME, Bidegain M, Boss RD. Palliative care in neonatal neurology: robust support for infants, families and clinicians. J Perinatol. 2016; 36(5):331-7. 36 Catlin A, Carter B. Creation of a neonatal end-of-life palliative care protocol. J Perinatol. 2002; 22(3):184-95. 37 Barbaro RP, Bartlett RH, Chapman RL, Paden ML, Roberts LA, Gebremariam A, et al. Development and validation of the neonatal risk estimate score for children using extracorporeal respiratory support. J Pediatr. 2016; 173:56-61. 38 Solomon MZ. What is bioethics worth? Hasting’s Center Report. 2016; 46(5):44-46.